When Ceylon Mitchell M.M.’16 first came to the University of Maryland for graduate school, he arrived with a strong passion for music. During his time at UMD, he gained something more — a love of multimedia production. Now, he has combined his passions to create M3 | Music Media, which provides personalized multimedia services to musicians. He started M3 while a student in the multimedia certificate program at the Philip Merrill College of Journalism. Mitchell developed the idea in his media entrepreneurship class and has since grown it into a full business. Mitchell’s own story as a musician began at a young age, as he grew up in the supportive and vibrant music community of Anchorage, AK. He developed an appreciation and passion for arts education, achieving selections in the Alaska All-State music ensembles, the Young Alaskan Artist Award competition and the Alaska Youth Orchestras, which will bring Mitchell back home as the featured soloist for its 2018 Fall Concert. 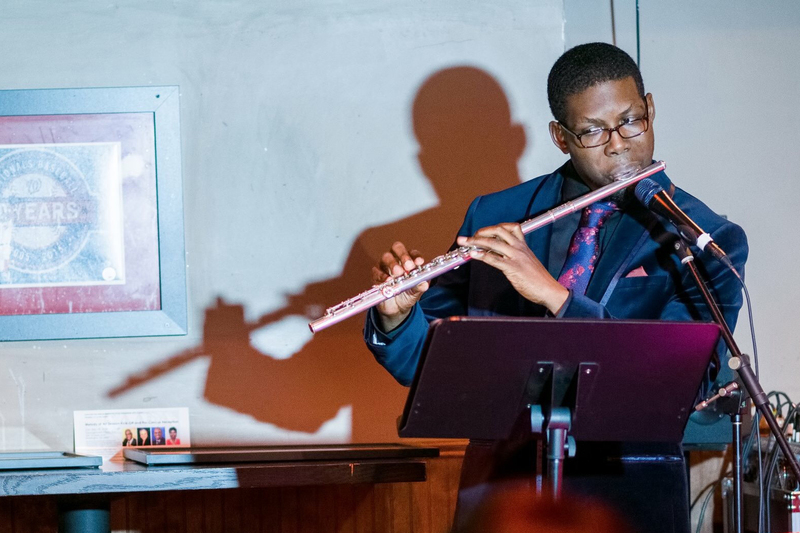 His passion for music eventually led him to pursue his bachelor’s degree in music performance at Boston University and, ultimately, to the University of Maryland, College Park. After receiving his master’s degree in Music Performance at UMD, Mitchell worked as staff in the Office of Community Engagement through 2017. Now, Mitchell works as the Director of Marketing and Communications with the Boulanger Initiative, an organization co-founded by fellow Terp Dr. Laura Colgate DMA ’18. The Boulanger Initiative promotes music composed by women through performance, education and commission activities. Mitchell is an active performer, educator and advocate in the Washington D.C. metropolitan area, where he teaches as the flute choir director with the Potomac Valley Youth Orchestra, performs with fellow Terps as co-founder and flutist of the Potomac Winds chamber music ensemble and serves as a member in numerous arts organizations. : the Arts Administrators of Color DMV, Coalition for African Americans in the Performing Arts, Emerging Arts Leaders DC (EALDC) and the Maryland Citizens for the Arts Emerging Arts Advocates (EAA). Earlier this year Mitchell received a 2018 Prince George’s County Forty Under 40 Award in Arts & Humanities. Recently, he helped plan, promote and present at the District New Music Coalition’s inaugural New Music DC Conference in September. Photo credit: Catrilla Watson, Coalition for African Americans in the Performing Arts (CAAPA).